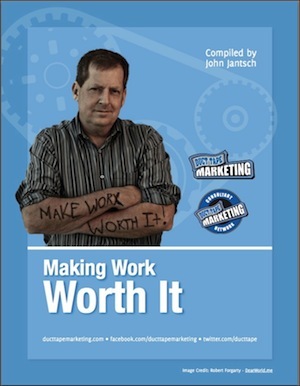 Tag Archives for " Make Work Worth It "
I’ve been collecting stories of late about what it means to be an entrepreneur, about what work means, about value, purpose and passion. I started asking people about their work and about what makes work worth it to them. I also experienced a fair amount of fear, angst and doubt when I asked this question. Some have stopped wondering about why they do what they do, some have lost hope that any of it matters and some are just simply so busy they don’t stop to think about much of anything as it relates to purpose. I’m on a mission to share this message and the profound impact that it can have on the lives of millions and millions of entrepreneurs and business owners toiling away in dreary and lifeless jobs. If you haven’t connected with that thing that makes work worth it for you, do it now, take a bold step and change course, reconnect with your customers and employees and revel in the awesome opportunity that owning a business or simply going to work in a place that has meaning affords. Tell your raw and real story and help others tell theirs. I really hope you choose to consider and share this collection of stories.